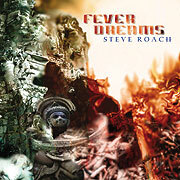 Within the opening moments of Fever Dreams’ first track, “Wicked Dream” featuring Patrick O’Hearn on bass, it is clear that a new chapter is opening on Steve Roach’s long and winding pursuit of potent soundworlds far off the traveled path. The music’s foundation is built upon long mid-tempo hybrid grooves with strong bass elements created from a combination of acoustic and electronic means. Steve Roach’s atmospheric and loop-spun melodic guitar textures rise and fall, intermix with his synth and computer alchemy to create an aura of complex emotional import. The overall feeling of Fever Dreams is one shrouded in an exotic amber-colored light filtering through an overgrown mental landscape of last night’s lingering fever dreams; the sensual atmosphere is especially present on the 30 minute track “Tantra Mantra” featuring percussionist Byron Metcalf. This release of floating, hypnotic groove meditations sets the course on a new direction presented over the three interconnected “Fever releases” planned throughout 2004.